It’s an age-old question: do you prefer to shave with a razor and shaving cream or an electric shaver? 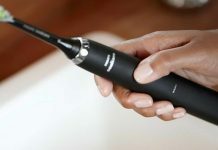 The electric shaver, although a little more costly, can provide benefits like creating less mess when shaving, and is a real advantage to those that have sensitive skin. 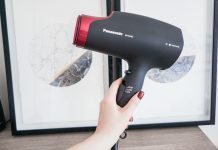 Philips, as maybe one of the most prominent electric shaver manufacturer, has a brand new shaver at the top-end of their product line: the Philips S9000 Prestige Electric Shaver with Qi Pad. 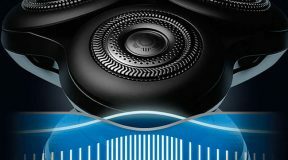 I had the opportunity of using the S9000 Prestige for a month and throughout this review I will focus on the device’s: ergonomic design, waterproof and wireless charging capabilities, cleaning and most importantly, performance. 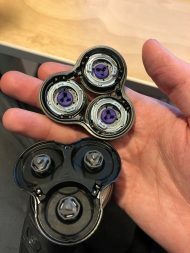 If you’re in the habit of using a manual razor, you may be surprised at how light and well-balanced the S9000 Prestige is compared to its appearance. When you first pull the shaver out of the included case, I’m certain you’ll be surprised by the product’s weight. It is designed with a black and silver finish and looks quite solid, heavy and industrial. However, when you grab the device, you’ll be surprised at how light it is. It fits perfectly in your hand and has a textured grip; for any game players reading this, it is a bit larger than a Nintendo Wiimote. The device has a large on/off button and a speed up/down button on the front. Your thumb will naturally sit in the right spot; you can tell that this device was pragmatically designed. The on/off button also acts as a “travel lock”. If you’re throwing the device in a suitcase and are afraid that it will turn on during transit, simply hold the button for three seconds and it will not turn on until it is unlocked again. The Philips S9000 Prestige is versatile: you can shave either wet or dry and you can even use shaving cream. The unit touts an IPX7 rating, meaning that the whole unit can be submerged in water of up to a metre in depth for half an hour. You can use the device under the sink, but you can also bring it into the shower or the bathtub if you’re in a hurry. The biggest differentiating feature between this shaver and other members of the Philips electric shaver family is the wireless Qi charging. 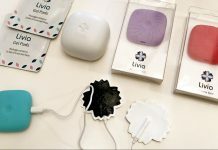 I have used other electric shavers in the past and I have always struggled with finding the charger and plugging it in (charging ports for this type of device are usually small and tight). The Philips S9000 Prestige comes with a sizeable wireless Qi charging pad that fully charges your device in 3 hours. 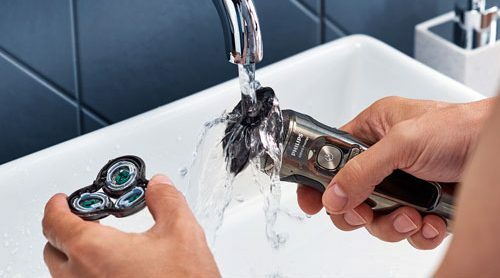 The shaver can be used for one hour on a full charge, but if you haven’t plugged in the device for a while and need to shave, the S9000 Prestige has a quick-charge feature that allows you to get enough use-time for one shave in just 18 minutes of charging. As an added bonus, if you have a phone that can be charged via Qi charging (like the iPhone 8 or Samsung Galaxy S8), you can pop the phone on the charger for some quick juice while you’re shaving. trapped inside of the inner chamber of your shaver’s head. 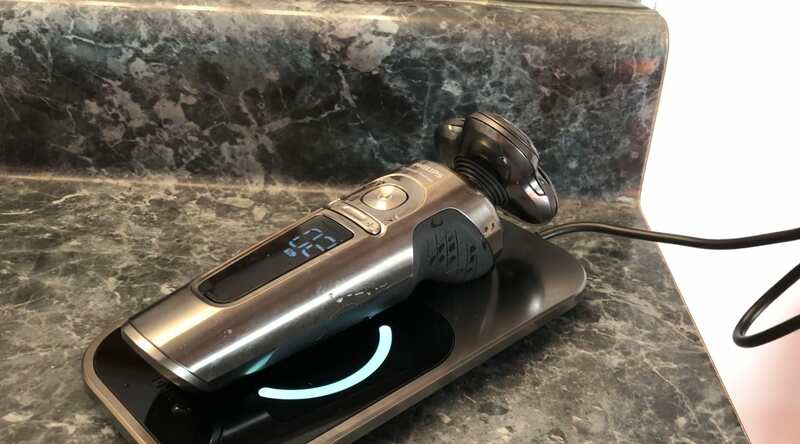 Much like the Philips S7000 and Philips S9000, there is a small ridge in the centre of the head of the shaver which allows you to pop the shaving head open. Run it under some water to clean it out and you will be ready to continue to use the device. It is my first time using a Philips brand electric shaver, so this feature was a pleasant surprise. On the care and maintenance side, the shaver’s head will need to be replaced every 12 months per the user instructions. Me after using the shaver! Now, performance. Let me cut to the chase, the Philips S9000 Prestige is the best electric shaver I have ever used. 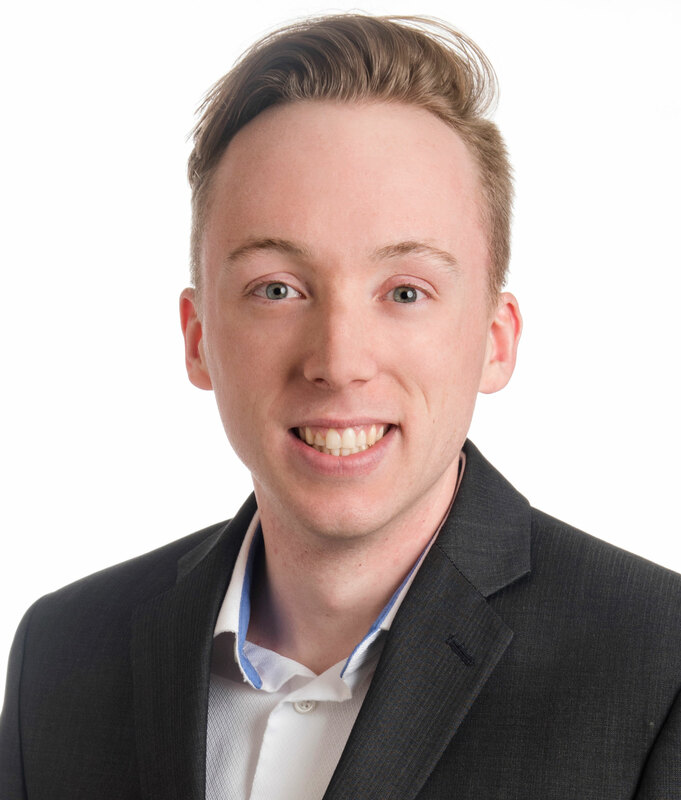 With facial hair, I usually grow my beard out for about a week and then shave it down to zero with the use of a traditional razor and shaving cream. When I grow out my facial hair, I use an older generation Philips Multi-Groomer to keep the mustache hair off of my upper lip. 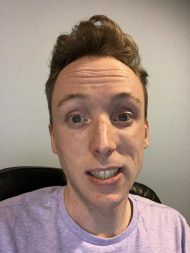 I have sensitive skin on my face and neck, so my biggest challenge with using a razor is that I typically leave my neck in pretty rough shape post-shave. All of the electric shavers that I have used in the past are good for a 3-day beard, but once you push it past that, you usually get “shaver pinching”. With the Philips S9000 Prestige, you can easily push your facial hair growth to a week or a little longer. 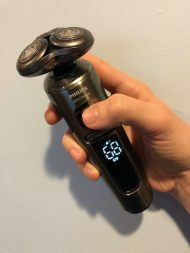 There are three technologies at play with this shaver that helps deliver a close and comfortable shave: ContourDetect, BeardAdapt, and NanoTech precision blades. ContourDetect allows for the device’s shaving head to easily manoeuvre around the curves of your face, BeardAdapt checks the thickness of your beard and mustache to lightly adapt its speed multiple times a second, and the NanoTech blades help give you a closer shave. The S9000 Prestige also has three different speed settings (sensitive, normal, and fast) to use based on the sensitivity of your skin. If you just need a quick trim, the device also comes with a trimmer. Replacing the rotary head with the trimmer is very easy, you just pull the rotary head off and snap on the trimmer. price tag may dissuade you from giving it a try, but for electric shaver users, this is the electric shaver that you aspire to use. Philips has multiple shavers in their line but if you’re looking for the convenience of wireless charging, a full-sized travel case that fits the charging pad, and advanced technologies that help you get a close and comfortable shave, you should definitely check out the Philips S9000 Prestige. For more information about shaving products, check out the Shavers & Groomers section of the Best Buy Canada website!